“Created with Alexandra Burke by MUA!! Lipstick and highlighting gloss that creates fuller curvaceous lips for a dramatic illusion of volume. 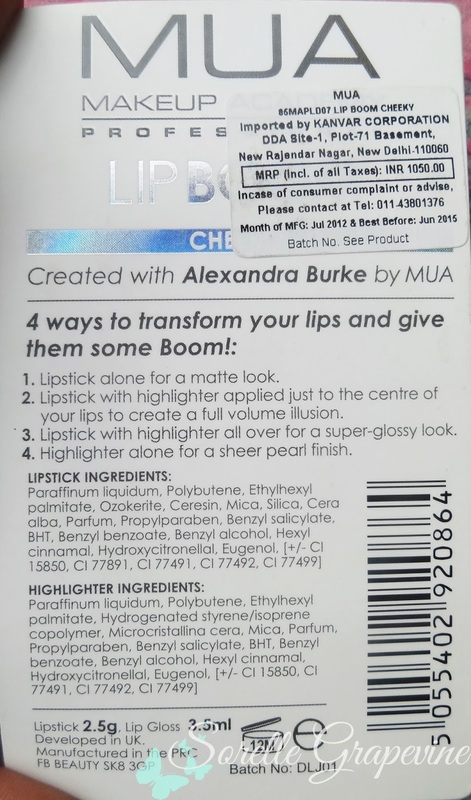 There are 4 amazing ways to transform your lips and give them some Boom! 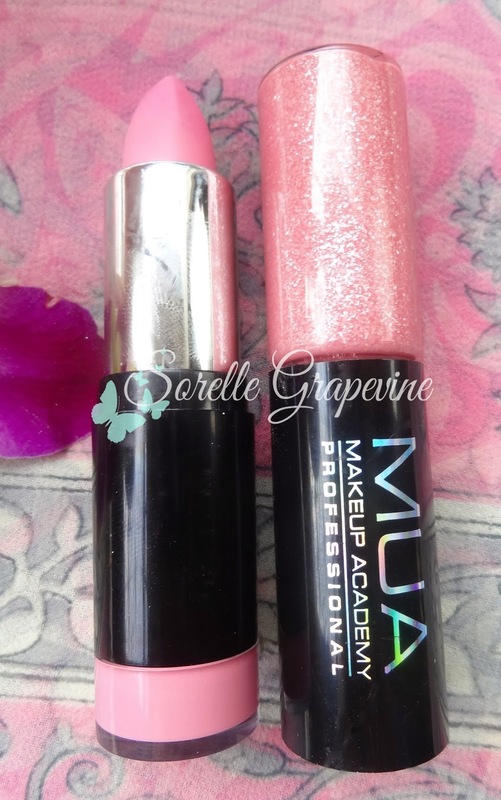 There are 2 products in this one tube like packing – lipstick and gloss. Made entirely of plastic this is over 3 inches tall and has the thickness of a lipstick. 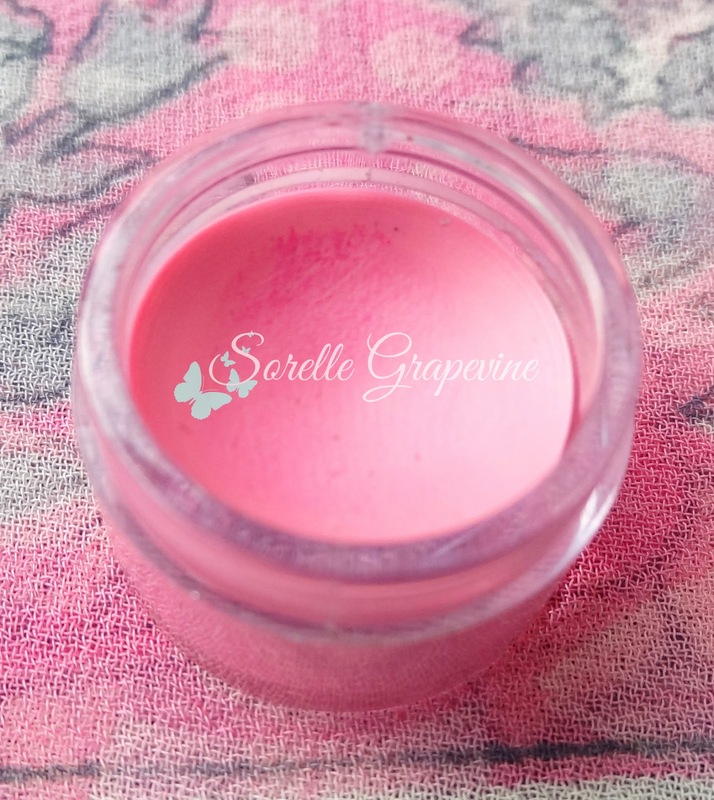 There is small transparent cap given in the bottom which shows the color of the lipstick and actually contains some product in it. You can just twist off the base and use it with a brush. The gloss comes with a standard doe foot applicator. Overall the look is decent and it does not either look cheap nor classy. You can easily carry it around in your purse but it might be a little cumbersome for a clutch. The lipstick is supposed to be a matte texture but I didn’t find it as drying and think of it more as a semi-matte. It is as unforgiving as a matte lippy though and by that I mean that it emphasizes any dryness or patches that you may have on your lips so remember to exfoliate before applying. This went on a little streaky for me which I rectified by patting my finger on my lips (something I picked up from Jyoti of Everything that matters). The result was a smoother even finish to it. If you let it be for a minute and allow it to set it does not transfer then. I tried kissing the back of my hand and got nothing on it. But eating/drinking does mess it up and it comes away looking patchy. 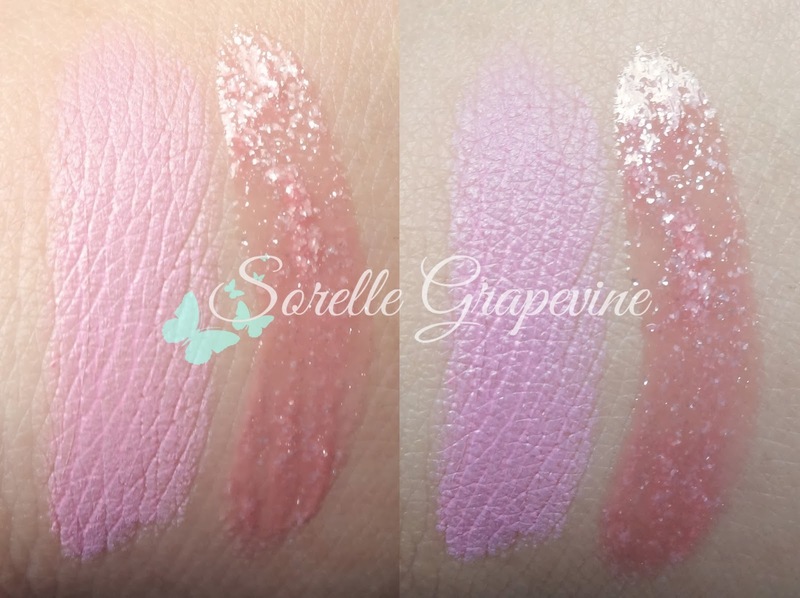 The lipgloss…..oh my lord the lipgloss! I’m a self confessed glitter/shimmer addict but this was beyond me. 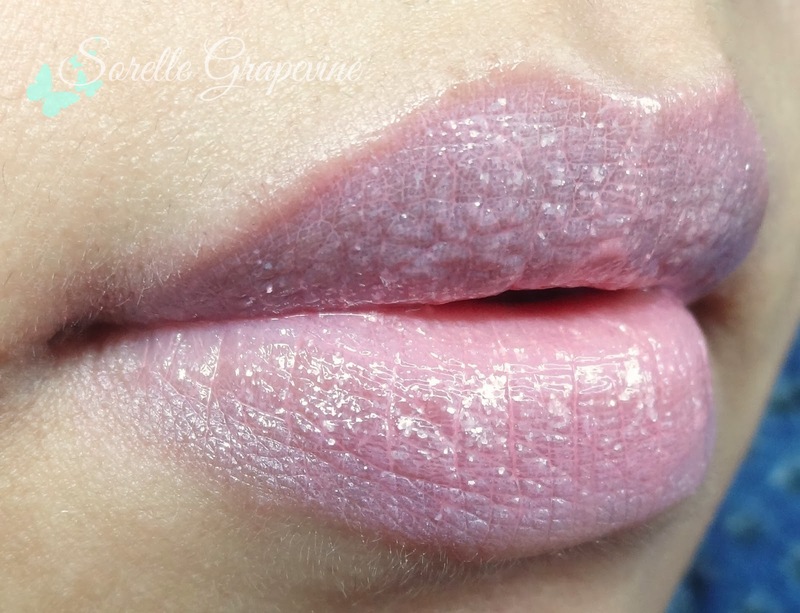 It is full of chunky glitter pieces which feel gritty on the lips and you can make them out sticking at all angles on your lips. They don’t add any dimension at all except make you look like a bad impersonation of a disco ball 😛 Not pretty at all! And so so irritating. Plus they get on everywhere when you try to remove them. Such a royal pain! What made them think that it was a good idea from any angle is beyond me. 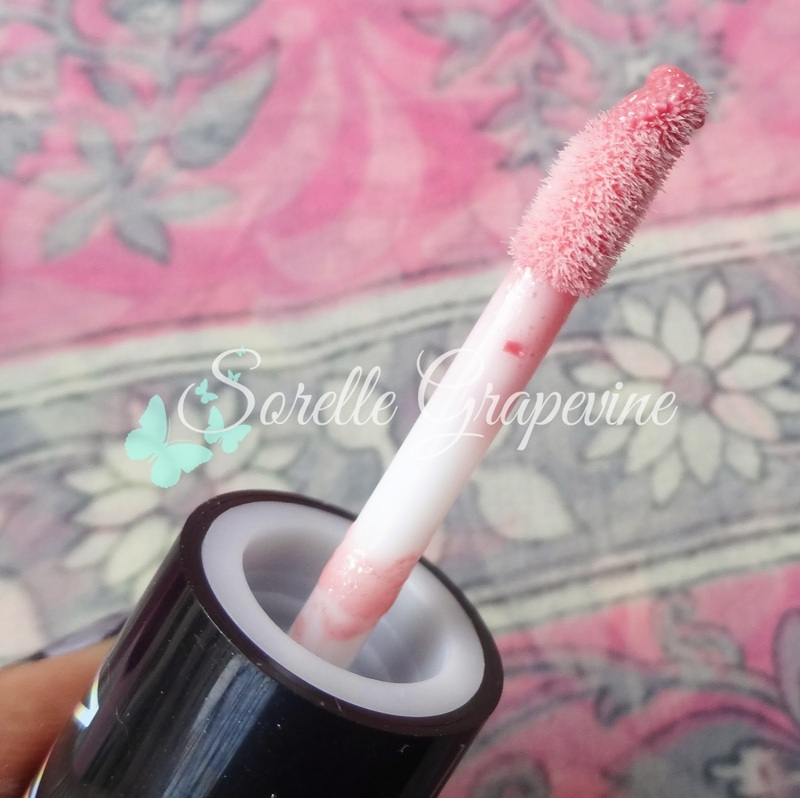 The lipstick is a very pale pink shade with a whitish tone to it. It washes me out completely and looks scary actually. Not a shade I would recommend on Indian skin tone. But it imparts full coverage. The lipgloss on its own is a very pretty shade of pink like a candy floss pink. It smells is so awesome and reminds me of NYX lipcreams – a lovely vanilla caramel that you just want to bite into. It is full of silver chunky glitter which is quite visible and looks very odd. The combination of the 2 does not lessen the whiteness of the the lipstick so for me it is unwearable. I would have never bought it. Though I like the texture of the lipstick though I’m not found of matte lippies at all but this for some reason is comfortable to wear. But the lipgloss is a complete no-no. There is a price tag of Rs. 1050/- on it which is completely absurd. You can buy this product from the MUA website for 3 Pounds which is like Rs. 301/-. Even with shipping I’m sure it wont cost so much. And the product is not worth the tag one bit. Honestly I wanted to be neutral about this product but it was such a turn off that I couldn’t mince my words. 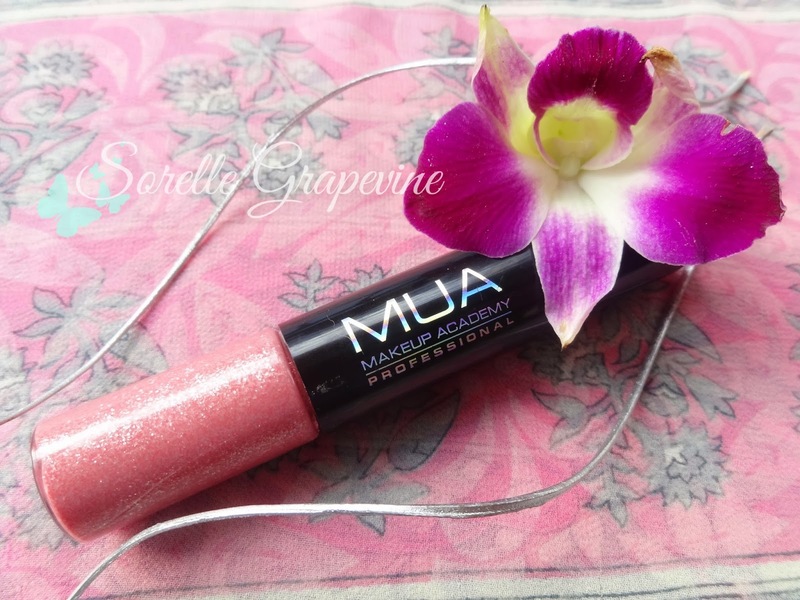 MUA has a lot of great stuff in its basket but this was not one of them. If only the glitter was better this would have been a great product coz the lipstick has a great texture and the gloss smells oh so lovely! But sadly it misses the mark. Hope you guys like the review. See ya! Would you purchase MUA Lip Bloom in Cheeky again? – I wouldn’t have bought it in the first place given the color. 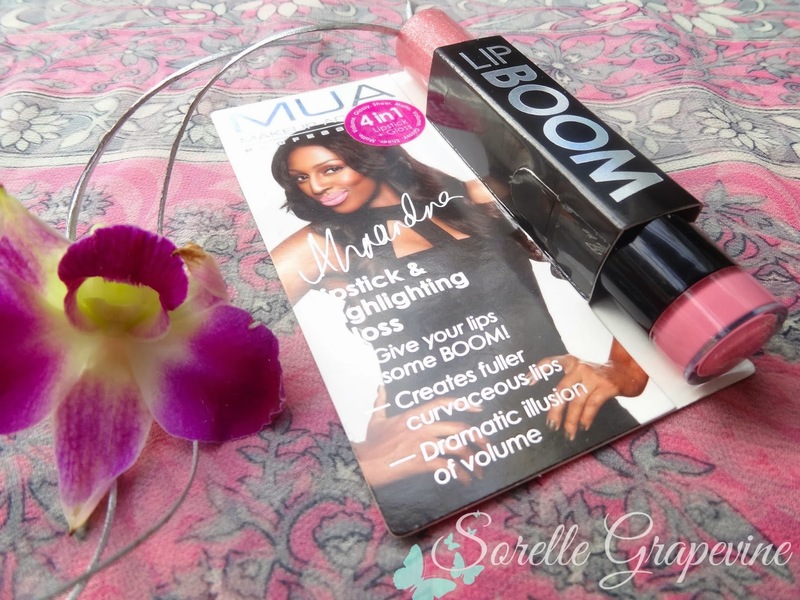 Would you recommend MUA Lip Bloom in Cheeky to your friend? – No!